Traveling on a motorcycle is a wonderful experience. It provides you with the ultimate thrill; nothing can be more interesting than an exhilarating journey that includes you and your bike. It is important to do extensive pre-trip planning and research if you’re planning to go on a road trip with your bike for the first time. But before you start your journey, there are many essential aspects to be taken into account. While traveling on a motorcycle, the most crucial aspect is choosing the perfect bike. If the ride you chose is in accordance with your trip and it makes you more comfortable, then it’s definitely worth it. The more comfortable your bike is, the more likely you are to ride it long distances again. Make sure you select your ride sensibly especially if you’re thinking to rent. Do the needful research and pick the perfect bike based on their mileage, maintenance, and seating position. Sports bikes look fantastic but are they perfect for long road trips? Not so much. So, keep in mind that riding the bike well is more important than you looking cool on it. After you choose a bike which fulfills your requirements, get the modifications done before you start your journey to ensure that it’s comfortable for you to ride. Have a smooth and successful trip with the right ride! If you’re planning to travel on your bike then dressing appropriately is essential. Always try a full face helmet, a cozy t-shirt, riding boots, and don’t forget to bring your favorite jacket. And if you’re expecting your ride to be bumpy, pick up elbow and knee guards to shield your knees and elbows in case of accidents. Wear clothes that are a perfect fit for you as loose clothing or gear will only be a disturbance and cause discomfort. Other important accessories include protective eyewear, biking gloves, and travel bags. Motorcycle accessories can be easily bought online or in moto stores. These gears not only make your ride safe and fun but it also gives you a biker look and greater confidence. So, to have a safe and adventurous trip, accessorize yourself with the right accessories. The golden tip! Ensure that you know your route. If you are not good at memorizing roads, bring a map or portable GPS system. Since technology always makes things better, so don’t be shy to invest in it. For example, you can buy a helmet which is Bluetooth-equipped. With this, you’ll be linked to your phone which will provide you with GPS directions. And if you are planning a trip to remote areas where there’s no network, carry a screenshot of the map on your phone or a hardcopy of the same. Also, ask the locals for the direction in case you’re lost. You might end up finding a lot more interesting route to your destination. While taking every factor of a road trip into account, factors like hydration are often ignored. But what they don’t know is that staying hydrated on the road is very important as it saves on all the exertion due to dehydration. Also, if you don’t want to stopover for water, carry a backpack hydration system. You can sling this over your shoulder and drink without taking off your helmet or even stopping. You can even add some Gatorade to your water if you want. Bring at least two gallons of water so that you never get thirsty. On the entire journey, keep staying hydrated on top of your priority list. Riding for several hours can take a toll on your mind and body. Also, the saddle sores, sprained neck, and back pain you get from riding a bike for several hours are far more uncomfortable. Proper rest in between is the sole solution. You should know when your body and bike need a break. Depending on the terrain, make sure to take a pit stop for few minutes after every hour of riding. Sometimes, even if you’re not feeling particularly tired at the moment, take time to stretch your legs, have a snack, drink some water, relax your back, and don’t forget to refuel your tank. You will have a hassle-free trip if you had a proper rest over the course of your journey. 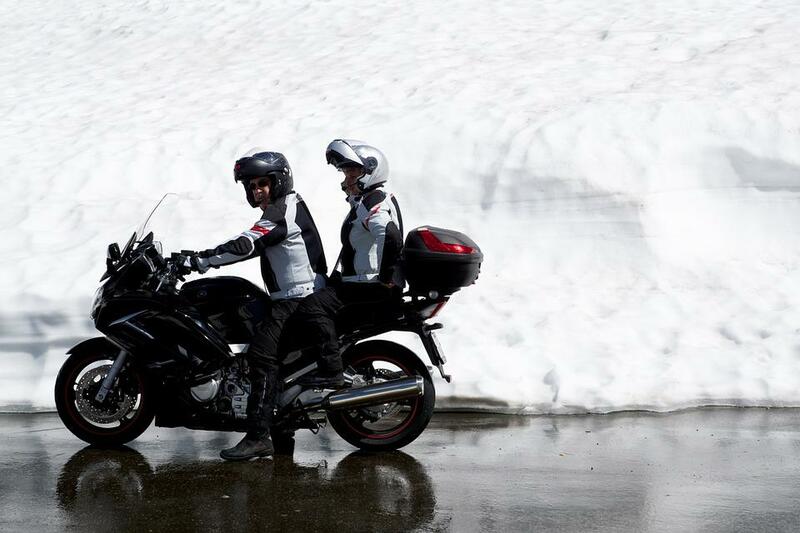 Contrary to a car trip, while traveling on a motorcycle you should be more careful in case the weather worsens. There’s an old saying that on any bike trip eventually at some point you’ll end up either wet, hot, or cold. So, if you don’t want to get roasted or end up being completely soaked, make sure that you’ve planned ahead and you’re ready to deal with an abrupt change in the weather. Don’t get caught in the elements of weather without the proper gear. From raincoats, rain pants, waterproof luggage, heated riding suit to motorcycle cover; don’t forget to bring your weatherproof gear along. Make sure you’ve taken extra measures to prevent yourself against the weather adversities as the ideal riding weather is hard to come by. If you’re hitting the open road, prepare yourself mentally for a little discomfort and enjoy the parts between extremes at the fullest as they are amazing. Few more things which you shouldn’t forget on your bike trip are a tool kit, a sense of adventure, and an extra pair of gloves. Even when the whole bike trip can be a bit tiring, the feeling of total freedom and the buzz it offers are indescribable in words. So, if you haven’t gone on a bike trip ever, start planning one immediately, you’ll definitely love it!